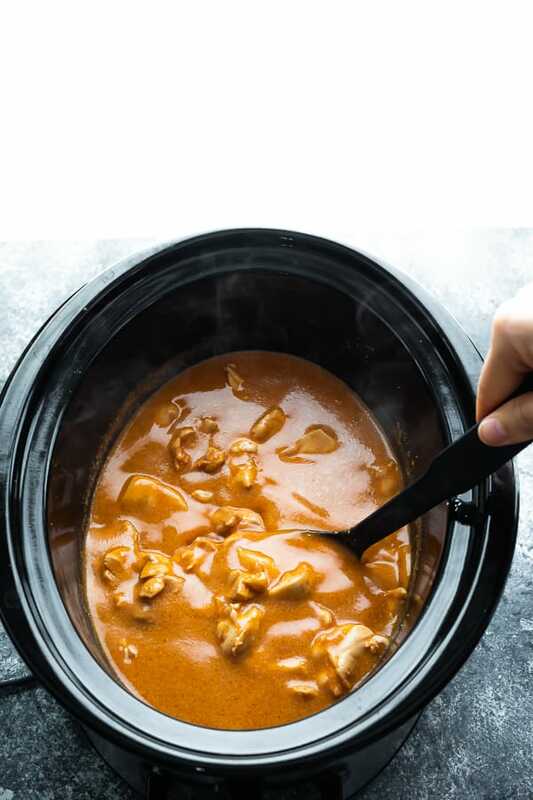 Slow cooker butter chicken made with good for you ingredients and can be assembled ahead and frozen for easy weeknight dinners! Dairy-free, gluten-free, low carb and deeeelish! Butter chicken is a total weakness of mine, and until now, I thought it had to be super heavy. 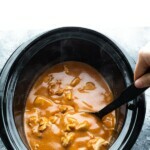 But this slow cooker butter chicken recipe is lighter without sacrificing flavor at all! You guys are going to be blown away by this recipe! It has so much flavor, despite not sautéing anything, and despite there not being any cream or butter. 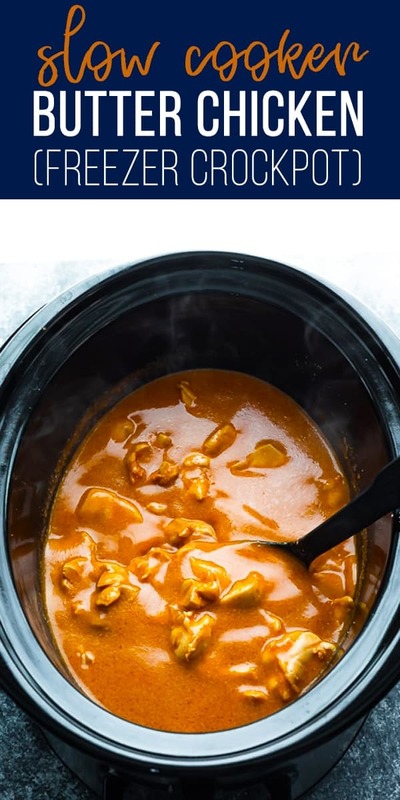 I’m sure traditionalists are going to turn their noses up at my healthy butter chicken, but if you are looking for all the flavors of butter chicken, without the fat and calories, you’re going to love it! it takes 10 minutes to throw together and no pre-cooking is required! For this recipe, we are using tomato sauce (pureed tomatoes, not ketchup! ), coconut milk, and a whole lotta spices! Toss them all together with some cubed boneless skinless chicken thighs, and cook up. 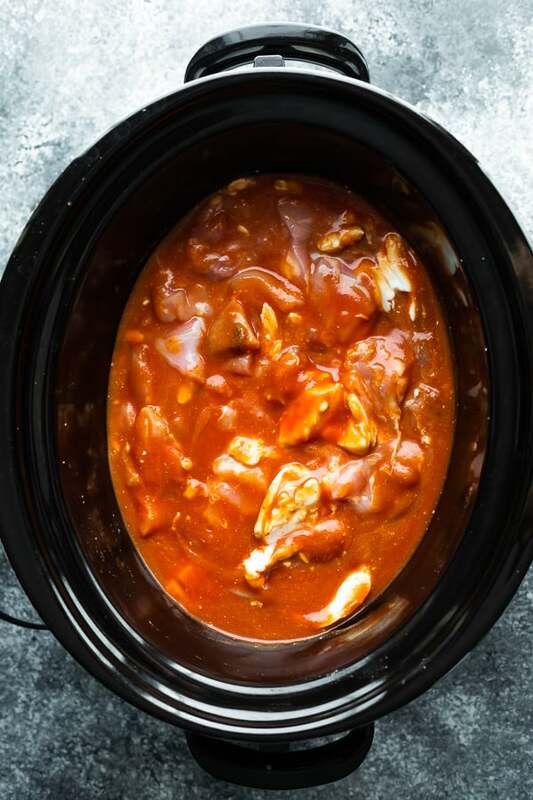 Can I use boneless skinless chicken breasts for this slow cooker butter chicken? Yes, you can! Swap an equal weight, and reduce the cook time to low 3-4 hours. 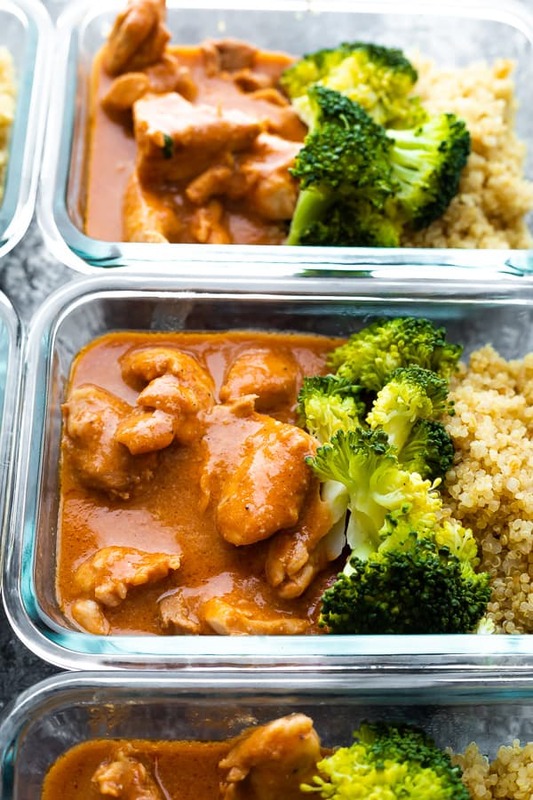 Can I add veggies to this healthy butter chicken recipe? Yes, but I prefer to add them towards the end of the cooking (about 1- 1 1/2 hours before serving). That way they don’t get mushy! I think small cauliflower florets and frozen peas would be great in this recipe. Just before serving, stir in the almond flour, lemon juice, and adjust salt to taste. 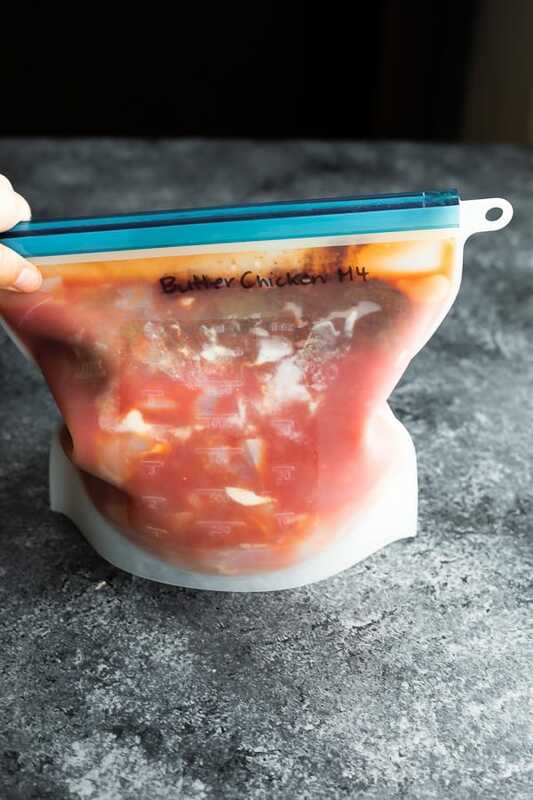 Combine all ingredients in a gallon-sized freezer bag, 1.5 L reusable silicone freezer bag, or storage container. Squeeze out as much air as possible and freeze for up to 3 months. 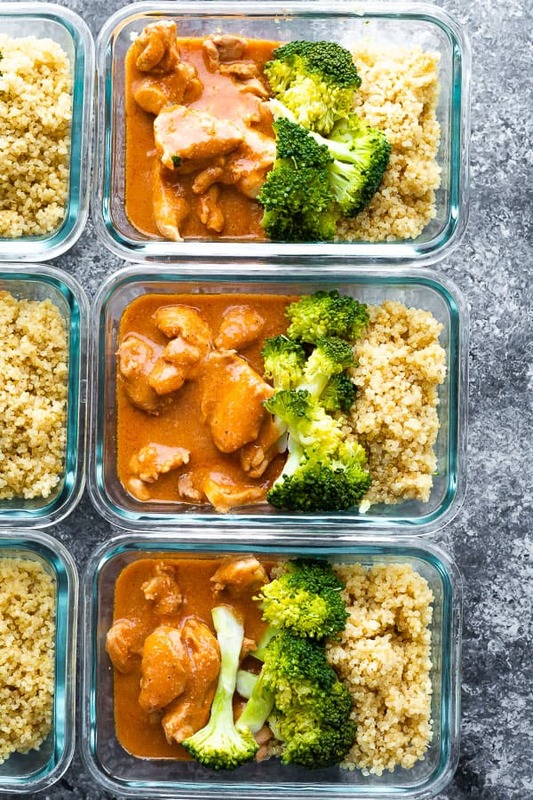 Portion out the butter chicken with rice (or quinoa) and steamed vegetables into freezer-safe meal prep containers. Cool completely, then freeze for up to 3 months. Thaw completely before reheating in the microwave until steaming hot. Yum! So simple! I used a can of diced tomatoes and ended up adding 4x tablespoons of cornflour to thicken it slightly as the tomatoes are thinner than tomato sauce would have been. The lemon juice at the end really does the trick! Love it! Hi Miriam! Thanks so much for your review, and good to know that cornstarch works as well! Does it have to be almond flour? Or would regular all-purpose work as well? Recipe looks delish and can’t wait to try it out! Hi Roxanne! Looks like one reader used cornstarch instead of almond flour. Worth a try?